Construction: DEHG - Curb,curb frame and cover are 14 gauge galvanized steel. DEHA - Curb,curb frame and cover are .090 aluminum. All seams are fully welded and ground smooth for weather tightness. 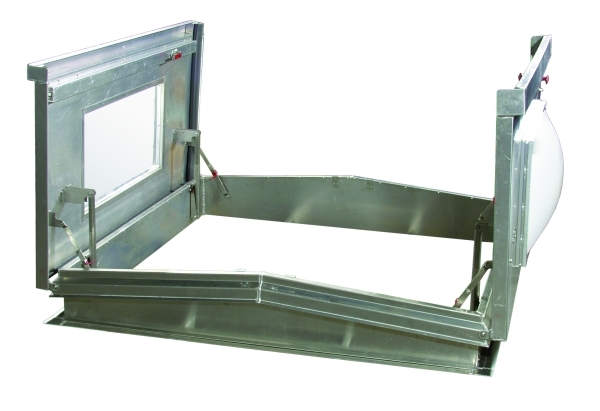 Includes 12” high curb with rigid insulation and 4” wide flange for securing to roof deck. The lid includes a one piece dome (or multiples) of either white translucent or clear colorless acrylic, a dome frame of extruded aluminum #6063-T5 with minimum thickness of .070 provided with a self-contained sloping condensation and weepage gutter for drainage. Lid construction is galvanized steel or aluminum exterior with metal liner and continuous bulb gasket door seal. Oversize doors may be spliced.